Twelve Days of (Creative) Christmas — STEAM Co.
How this year’s Christmas ad from Elton John and John Lewis was a gift to us. In fact it inspired us to take to the road for Twelve Days of (Creative) Christmas with our art. We took our half day #ARTofROCKETS session to UK school communities between Cornwall and Carlisle for 12 Days of Creative Christmas 1-12 Dec.
We were really grateful to a few generous sponsors for helping us by sponsoring these half days stops in challenged communities that would appreciate it and the schools that made donations to help us along? Whether the #ARTofSONG or the #ARTofROCKETS, we say that ‘Art is what we call it when what we do might connect us’, that ARTCONNECTS. Read more, watch the films and find out more about our upcoming #ARTCONNECTS19 Festival of Creative Schools, Work and Lives. You too may have seen ‘The Boy and The Piano’, the beautiful film that Elton John made with Adam And Eve DDB, one of the UK’s most acclaimed and creative advertising companies, for John Lewis this Christmas. A story of how a Creative Gift one Christmas had transformed a young life and in the process connected with many others. It certainly connected with us. In fact it inspired us to take that film and a few others on a UK Tour. Here’s how that journey inspired our film: ‘The Boy and The Trainset’. After a desperate and largely unsuccessful plea for sponsorship to help us take our half day #ARTofROCKETS session to schools in challenged school communities across the UK we did it anyway, with schools themselves making donations to our costs where they could. We visited schools from Cornwall to Carlisle on the most magical journey. And yes, as usual, we made it up as we went along. When we arrived in Bradford the day that music teacher Jimmy Rotherham got shortlisted as one of the world’s best teachers, we blagged a big screen for some PowerPoint action. And when we popped into the Sheffield branch of John Lewis to replace a laptop power supply we’d left in a school the day before, we saw a creative present that we just had to take to a little lad in Leeds. Every day was magical but the highlight had to be rocking up at Feversham Primary in Bradford the day that their music teacher, Jimmy Rotherham had been shortlisted for the Global Teacher Prize. So we rented a big screen to celebrate! Watch the film of that day here. If you’re interested in having this session in your school or sponsoring a session, sign up here. We recently ran a few school day sessions about the #ARTofENGINEERING as part of Tomorrow’s Engineers week with visits to schools in Sheffield, Hull and Birmingham. The following weekend the Headteacher from the Birmingham school emailed us to say that he’d heard that the John Lewis Christmas advert was to feature ‘Rocket Man’ by Elton John. We soon found they hadn’t. So that was that. Or was it? We were blown away by the ad that John Lewis did release the next morning, featuring Elton John. A beautiful film, by the ad agency Adam and Eve who co-funded STEAM Co.’s first ever event at the Royal Institution in 2015. It showed Elton’s story in reverse back to the day he was given his first piano. It showed how that gift of music, of a career of art sowed a seed for a passion that would power both Elton’s life and the UK economy, generating millions of UK £GDP. Within a few hours, the STEAM Co. video elves had released the STEAM Co. remix you see above that highlighted the looming creativity crisis in our schools with arts and creative education under severe pressure due to both government policy and a lack of awareness among some parents, teachers and policy makers of the opportunities that creativity and creative industries offer our young people. WIth 24 hours that film had received over 50,000 views and even Elton John had ‘liked’ it on Twitter. 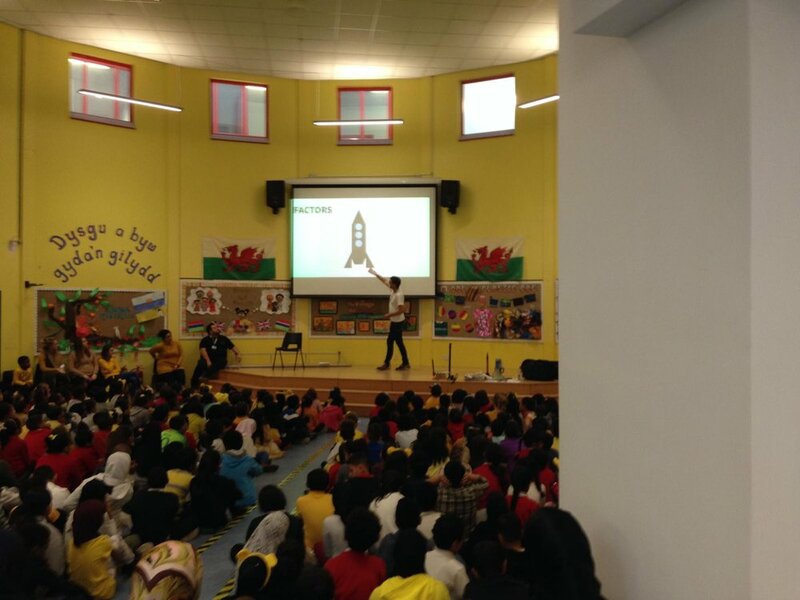 The next day Nick ran the STEAM Co. #RocketKids session (see below) in a really challenged school in Cardiff Bay, South Wales. This was particularly poignant given that ‘Rocket Boys’ was set in a dead end coal mining town in West Virginia back in the 1950’s and told the story of four boys who escaped that dying world using their creativity, support of their community and a determination to succeed. They learned to make rockets and ended up working for NASA. Nick told how his 83 year old dad had found Rocket Boys’ in the Oxfam bookshop he volunteers in and then showed the John Lewis Christmas advert to the 500 children and parents and other carers in the assembly and discussed it with them. He was blown away by some of the responses from the children. He then showed them the amazing official video for ‘Rocket Man’ that Elton and YouTube had commissioned from Iranian filmmaker and refugee Majid Adin which tells a new story of adventure, loneliness and hope. In the afternoon Nick gave a talk at the National Education Show in Cardiff, Wales’ biggest gathering of educators. In a poignant session, Nick showed a film of his equivalent gift to Elton’s piano, a film of himself aged one with his dad and his first train set. He described how, like Elton, that gift had inspired his passion, but for Nick it was engineering, making and doing, maybe even co-founding STEAM Co.
His talk was titled ‘It takes a whole village to inspire a child (and two elephants)’ and told how STEAM Co.’s community engagement model brings those two elephants in the room - parents and the wider school community of other carers like artists, engineers and employers - into primary schools to run mini creativity festivals called STEAM Co. Days. After that special day, a few things dropped into place for Nick and he had an idea to make a film to launch a campaign. He found a quiet room in Cardiff CIty Hall and shot some clips and edited them together on the train back to London. 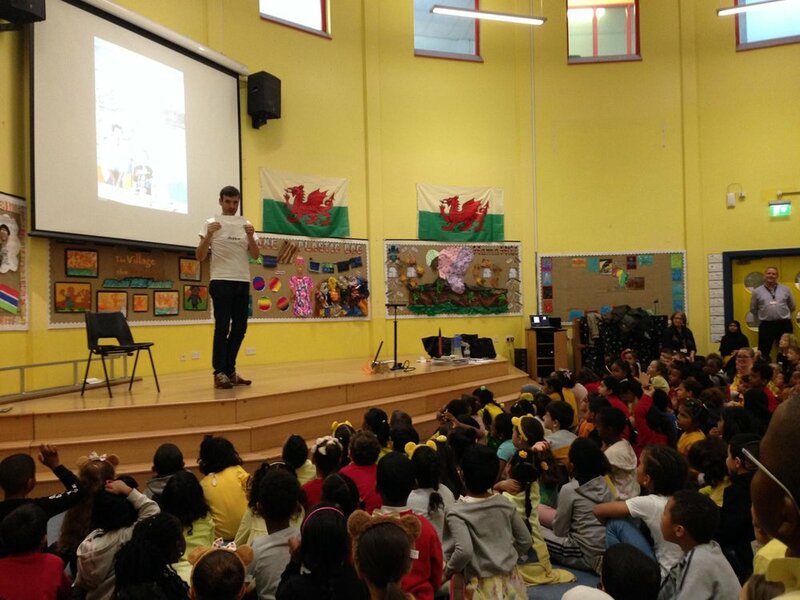 Nick launched STEAM Co.’s latest campaign to help Advocate, Inspire and Action Creativity - a tour from Land’s End to John O’Groats taking the #ARTofROCKET Session to #RocketKids in challenged school communities who might not be able to cover the £300 donation we hope for at other times. It will be the first 12 Days of Christmas 1-12 December, starting down in Cornwall and ending up in Scotland, as close as we can get to John O’Groats. The plan is to ask individuals, organisations and companies to make the donation and to help generate funds for the upcoming #ARTCONNECTS19 Festival of Creative Schools Work and and Lives, a ten day national event to celebrate and showcase creativity, tech and people to connect. While we were on the road, we told everyone about our national ten day #ARTCONNECTS Festival of Creative Schools, Work and Lives. 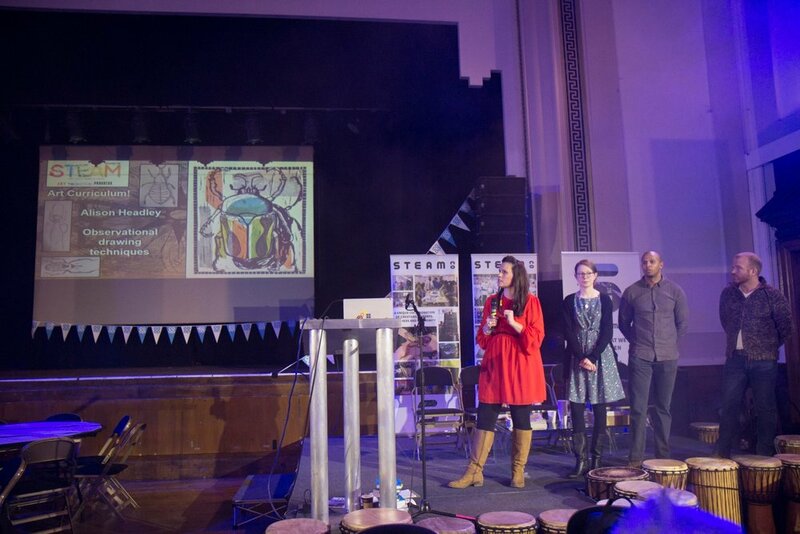 We want #ARTCONNECTS19 to inspire Schools and Communities across the UK to run small events during the week under the #ARTCONNECTS banner - art shows, concerts, hackathons, dances and other gatherings where you celebrate their art. We hope that schools who are lucky enough to be chosen for a free #ARTofROCKETS session on thsi tour will consider, even pledge to run an independent local event as part of #ARTCONNECTS19, even if just the smallest art show in the school or reading. Then, we’d love to see everyone come down to London for a big weekend of short talks, activities and a dance. Saturday and Sunday will be a day of short talks, performances and activities for all the family. This is not an academic conference, but a Festival, without the mud and camping. Find out more and sign up here to be sure you get the updates and 3 minute video blogs of last year’s event as we release them. Whether you’re a school, a sponsor or have a creative Christmas present idea sign up here now. Any problem email us at yourturn@steamco.org.uk but bear with us for a reply. A half day session for Primary and Secondary Schools, based on the best selling book and movie 'Rocket Boys' by Homer Hickam which Nick’s dad found in the Oxfam Book Shop he volunteers in in Ludlow and which he said was the best book he's ever read. It's a story of 4 boys growing up in a dead end Coal Mining Town in West Virginia in the 50's, who see the first Sputnik and, with the encouragement of a teacher and mother, go on to make rockets and work for NASA. A half day session for the whole school and school community to enjoy. “THE CHILDREN WERE OVERWHELMED BY IT.